A petrified man was found some time ago in the mountains south of Gravelly Ford. Every limb and feature of the stony mummy was perfect, not even excepting the left leg, which has evidently been a wooden one during the lifetime of the owner - which lifetime, by the way, came to a close about a century ago, in the opinion of a savan who has examined the defunct. The body was in a sitting posture, and leaning against a huge mass of croppings; the attitude was pensive, the right thumb resting against the side of the nose; the left thumb partially supported the chin, the fore-finger pressing the inner corner of the left eye and drawing it partly open; the right eye was closed, and the fingers of the right hand spread apart. This strange freak of nature created a profound sensation in the vicinity, and our informant states that by request, Justice Sewell or Sowell, of Humboldt City, at once proceeded to the spot and held an inquest on the body. The verdict of the jury was that "deceased came to his death from protracted exposure," etc. The people of the neighborhood volunteered to bury the poor unfortunate, and were even anxious to do so; but it was discovered, when they attempted to remove him, that the water which had dripped upon him for ages from the crag above, had coursed down his back and deposited a limestone sediment under him which had glued him to the bed rock upon which he sat, as with a cement of adamant, and Judge S. refused to allow the charitable citizens to blast him from his position. The opinion expressed by his Honor that such a course would be little less than sacrilege, was eminently just and proper. Everybody goes to see the stone man, as many as three hundred having visited the hardened creature during the past five or six weeks. 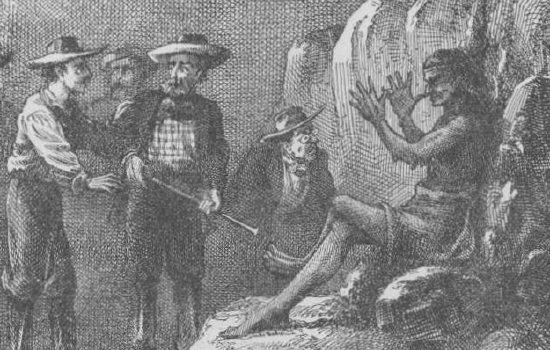 Illustration of the Petrified Man from 1882 edition of Twain's Sketches, New and Old. Note the position of the Petrified Man's hands. Twain later admitted that he was surprised at how many people were fooled by his story. It was his first attempt at a hoax, and when he penned it he had considered it "a string of roaring absurdities." But once he realized how well his deception had succeeded, he admitted feeling a "soothing secret satisfaction." "One could scarcely pick up a paper without finding in it one or two glorified discoveries of this kind. The mania was becoming a little ridiculous. I was a brand-new local editor in Virginia City, and I felt called upon to destroy this growing evil; we all have our benignant, fatherly moods at one time or another, I suppose. I chose to kill the petrifaction mania with a delicate, a very delicate satire." Of course, his satire didn't exactly work, since most people failed to recognize it as satire. Indeed, he was later "stunned to see the creature I had begotten to pull down the wonder-business with, and bring derision upon it, calmly exalted to the grand chief place in the list of the genuine marvels our Nevada had produced." His second motive was to mock a local politician, Judge Sewall, whom he considered to be a bit of a pompous fool. He explained, "I had had a temporary falling out with Mr. — —, the new coroner and justice of the peace of Humboldt, and thought I might as well touch him up a little at the same time and make him ridiculous, and thus combine pleasure with business." "I think that for about eleven months, as nearly as I can remember, Mr.— —'s daily mail-bag continued to be swollen by the addition of half a bushel of newspapers hailing from many climes with the Petrified Man in them, marked around with a prominent belt of ink. I sent them to him. I did it for spite, not for fun. He used to shovel them into his back yard and curse." Twain noted that the Petrified Man article did contain one prominent clue that, for careful readers, should have identified it immediately as a farce. Note the position of the Petrified Man's hands. They're arranged in a gesture of ridicule. But the gesture was too obliquely described. Twain admitted, "I was too ingenious. I mixed it up rather too much; and so all that description of the attitude, as a key to the humbuggery of the article, was entirely lost, for nobody but me ever discovered and comprehended the peculiar and suggestive position of the petrified man's hands." Fedler, Fred. Media Hoaxes. Iowa State University Press, 1989: 43-44. The Works of Mark Twain; Early Tales & Sketches. Vol. 1. 1851-1864. University of California Press, 1979: 159. Paine, Albert Bigelow. Mark Twain. Vol.1. Harper & Brothers Publishers, 1912: 211. Mark Twain, "The Petrified Man" in Sketches New and Old, The American Publishing Company, 1882.